Linear velocity of impact hammer crusher is according to the requirements of materials property, crushing ratio, machine structure, and also considering the wear grade of hammer head. The higher linear velocity increases impacting speed and achieves more chance to strike materials that help to get fine product granularity and improve production capacity. But too high liner velocity blocks materials entering into strike zone, increases hammer head abrasion, reduces energy utilization. Reducing the linear velocity can decrease the hammer head abrasion, but at the same time, it will increase the contact probability of material and hammer dish so as to increase the abrasion of hammer dish. The selection of linear velocity is a comprehensive process. Since it is affected by the hammering, grinding and cutting action between hammerhead and grizzly bar, the suitable value is 30-40m/s. There are many factors to affect the production capacity, such as crushing ratio, rotation speed, materials physical property, granularity distribution, machine structure and so on. 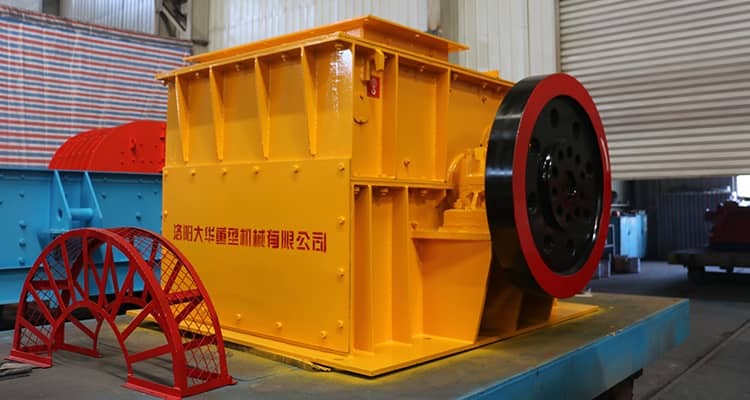 The power is subject to the material property, crushing ratio, and the processing capacity as well as the impact of rotational inertia of rotor when the hammer is asymmetry at the start phase. The determined power can meet the requirement of rapid recovery of energy consumed by the hammer head in one impact crushing process.